Below is a short description of landscape settings (climates and snowlines). Please use the "Landscape Settings" dialogue to interact with these settings. Snowlines are at absolute height levels. Climate zones are at absolute height levels. If two climates have the same value only the first climate is shown on map. 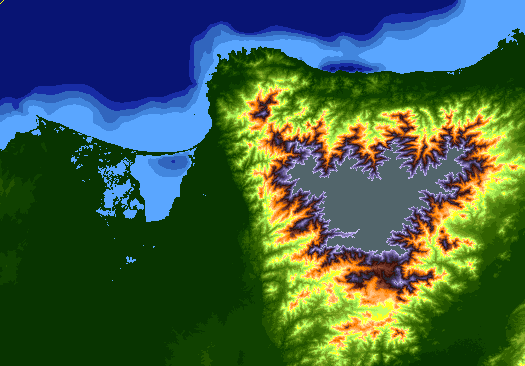 How to apply climates on heightmaps derived from real world data? Here is an example with almost 60 ground levels and climates applied according to reality. Pico Cristóbal Colón - a high mountain (5700 m) in northern Colombia, very close to the coast. Play yourself with this heightmap here (2108x1472 pixels). It was derived from high resolution topographic and bathymetric data plus a custom colormap for grayscale levels. I'm a little confused. I just went to the Nightly Builds site, but the current version there is 8387. Where can I download 8415 referenced in this post? Our supplier of nightly build services seems to be having problems. To get changes done in revision after 8387, you'll have to check out the source code and build it yourself (which I consider fairly complicated, unless one is using Linux), or get someone to do it for you.